It’s that time a year again. Time for the Lucia Run or the ”Lucialøb” where we get together with our good friends of Kayak Republic to brighten up Christmas Copenhagen with lots of lights and lots of singing from the water and from the streets. On the 13th of December, we once again run through the streets of Copenhagen for the annual Lucia Run. This is by no comparison one of the most ”hyggelige” and beautiful runs that Copenhagen has to offer, as you will find yourself standing in the cold and crips Copenhagen while hundreds of lit up kayaks are arriving along the canals. From the water, the kayakers will have a magnificent view of the lit up runners that follow the quayside on the way to the next stop. At each stop, we all gather and sing the Santa Lucia song before moving along to the next singing spot. The event is organised together with Kayak Republic and it’s free to join, but we organise it as a charity event, so we strongly encourage you to pay 100 DKK to Amnesty International who will be on the quayside collecting your hard earned money. In return, you will get a badge that shows that you have supported the important work that Amnesty does. So this is not only good exercise but also good conscience. 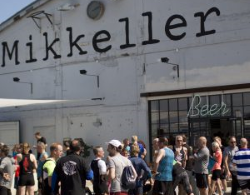 The run finishes at Kayak Bar where kayakers and runners gather for Æbleskiver and Gløgg. For those who would like the fun to continue, there is the option to join the Christmas Dinner afterwards, which is always super cosy and great fun. Everyone is welcome and everyone is friendly. DON'T TRUST US - TRUST OUR CUSTOMERS!